Time for another cover reveal, this time it's the latest in EJ Wesley's Moonsongs series. Now this cover, in my opinion, is what you might call "badass". What do you think? Dragon's Game, Moonsongs Book 4, finds Jenny out of her rural West Texas element, searching for an evil witch in an urban Houston nightclub. After attempting to help a handsome and mysterious stranger out of a jam, she finds herself on the run from a ruthless gang who are even more dangerous than they initially appear. Forced into a twisted game of life and death, Jenny must navigate the complexity of a budding relationship, and somehow survive a night filled with unexpected horror and paranormal mystery. Dragon's Game is approximately 14,000 words or 45 pages, and is the fourth volume of the Moonsongs Books, an ongoing series of New Adult, speculative / urban fantasy novelettes by author E.J. Wesley. Add Dragon's Game to your Goodreads shelf! And for a limited time, you can catch up on the entire Moonsongs series for just .99 cents (regularly $2.99) - Moonsongs Anthology 1 is on sale October 15th - 20th at Amazon and Barnes & Noble! Growing up in small-town Oklahoma, there were limits on the amount and types of entertainment at my disposal. Perhaps that’s why I set my imagination free. After collecting degrees in psychology and counseling, life brought me to Missouri, Texas, and Northern California—where I currently read, write, and live. I fill my spare time playing video games, watching movies, planning for the zombie apocalypse, reading graphic novels, and playing with my dogs. My passion for New Adult literature led me to producing the weekly New Adult Lit Chat on Twitter, and contributing to the NA Alley Blog. 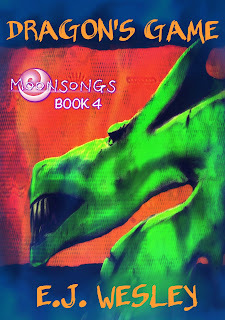 I’m also the author of the Moonsongs Books, a series of New Adult, speculative-rural fantasy novelettes. Congrats, EJ! I've read the first of his series, which was gripping, and I look forward to catching up with the rest. I'm back from my holiday today, so I look forward to catching up with you all. Don't forget it's the last day to enter my Two-Year Blogiversary Giveaway where you can win a full edit on your book. And have a lovely weekend! Felt compelled to go buy that anthology. So I did! Congratulations! I'm seeing this book everywhere today! He had me at dragon! Yay for EJ! I love this cover and can't wait to read the book. His Moonsong series is awesome. Yay for EJ! The cover is awesome. I've seen E.J. 's book around a lot this week. Congrats to him on this release. Congrats, EJ... All the best!!! Hope you had a good time on holiday, Nick! Nick, thanks so much for sharing my cover! Was traveling most of last week and still trying to get around to everyone to say how much I appreciated the help!